As many of you know, I am not a native-born Atlantan. I do, however, have one daughter who is a native Southern belle and one who was born in LA, but moved here at 18 months so she might as well be a native. Many of my best friends are born-and-bred Atlantans (which, these days, is like saying you’re a native Los Angeleno…a rare bird indeed). A number of others are from different parts of the South and, in that I include Texas and Florida though purists may dispute their “southern” provenance. Our friends back in the midwest and California find this fascinating and love to ask about our life in the South. I know many of them have been waiting for a snarky essay from me about being surrounded by rednecks and right-wing conservatives. What they don’t understand, though, is that I live in the city of Atlanta which just happens to be surrounded by the state of Georgia. I don’t necessarily consider myself a Georgian. In fact, unless we’re headed to a friend’s lake house or we’ve rented a cabin in Blue Ridge for the weekend, Ad Man and I rarely venture outside the city limits. So, while they may be expecting a field guide to spotting hicks and fire-and-brimstone preachers, the truth is, we don’t see too many of those folks in the big city, or at least, not in the places where I hang out. Moreover, we live in a neighborhood that’s considered the “Beverly Hills” of Atlanta. This is not to brag. Believe me, we paid about the same amount for our house as we would have for a kickass parking spot in San Francisco. So, we live in the midst of lots and lots of conservatives, but very few rednecks. Plus, in these days of ‘Duck Dynasty,’ I highly doubt you need my assistance spotting a redneck in the wild…unless, of course they’re passed out drunk in the bushes dressed in head-to-toe camo. What this post will do, however, is allow you to spot a well-to-do Southern lady or gentleman from a mile away. A few months ago, I flew into Chicago’s O’Hare Airport to spend a weekend with some law school friends. Heading home, I was wandering around far from my gate when I spotted a woman in the crowd who, I had no doubt, was from Atlanta. She was a perfectly coiffed blonde, dressed in a Tory Burch tunic, cropped white jeans, Tory Burch wedges and carrying a Louis-Vuitton handbag. A few hours later I saw her again on my plane back to Atlanta. That’s when I realized I had a gift. I have since developed a bit of a checklist that I’m now passing on to you, dear readers, for spotting a well-to-do Southerner in the wild. First the women…ladies from the South tend to display a number of distinctive characteristics. Just as the woman at the airport, they tend to have an affinity for anything designed by Tory Burch. 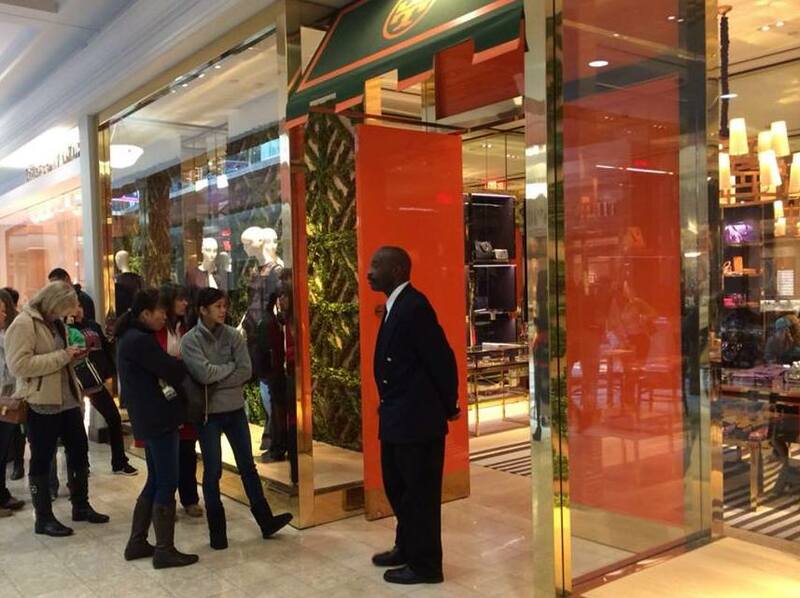 As you’ll see from the attached photo, I’ve personally spotted them lined up en masse outside the Tory Burch store at the crack of dawn the day after Christmas. Even a wealthy Southern lady loves a bargain. They are perfectly turned-out at all times. I defy you to try to sneak up on a proper Southern lady and find her in sweatpants, hair in a ponytail, no makeup on and in need of a manicure. It simply does not happen. They’re even pristine in their tennis wear. I swear the women have no sweat glands! There are a number of other brands around which you may find them flocking. Hermes is one because, well, why should Grandaddy’s horses get all the fancy leather accessories? They and their female young bear the distinctive markings of matching Lilly Pulitzer shift dresses all summer. They also tend to have a strange infatuation with quilted and garishly printed bags and other accessories from Vera Bradley. 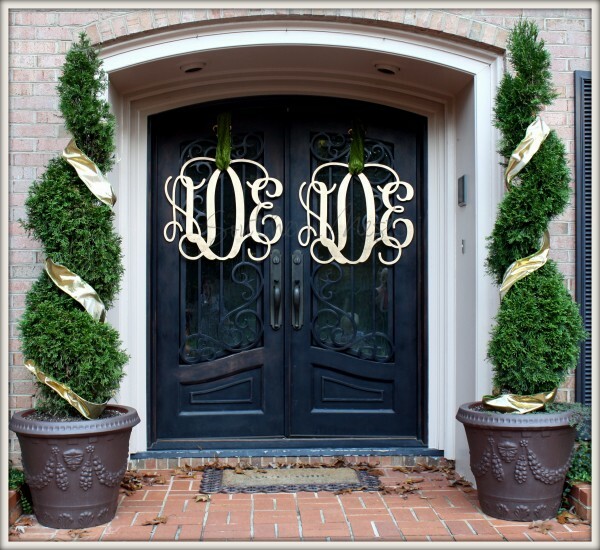 Southerners (women and men) monogram EVERYTHING. They monogram clothing, of course, including every single piece of their childrens’ wardrobes. (Forget about getting hand-me-downs from a wealthy Southerner.) But, clothing is just a start. They monogram beach bags, beer cozies, iPhone cases, linens, insulated cups for concealing bourbon and ginger ale roadies, even their cars. This is not an exaggeration. As an outsider, I can only surmise that this is a way of marking their territory without the mess of having to go around peeing on everything. A Southern lady has a vast array of crisp gingham shirts and white jeans to choose from. In winter, they reach for their (ironed) blue jeans, barn jackets and riding boots. It’s a rare Southern lady that doesn’t love a diamond the size of a grape. Some of the diamonds at my children’s public school edge into Kardashian territory. (I guess that makes sense given their classmates include the children of NFL players and country music superstars.) In fact, the theme for the school’s big semi-annual fundraiser this year is “Denim and Diamonds.” Enough said. As for Southern men, they seem to have latched onto the east coast preppy style when it was ubiquitous and never let go. Spotting a well-to-do Southern man isn’t difficult. His casual wardrobe consists mainly of polo shirts, wind jackets, sweatshirts and other items of clothing emblazoned with the logo of this favorite college football team…generally his alma mater. To this fanwear, they add pleated khaki shorts or pants, a braided leather belt and loafers without socks. A Southern man of means sticks to a wardrobe of perfectly tailored suits, generally purchased at Brooks Brothers or Sid Mashburn in Atlanta, Gucci loafers, a pocket square (always!) and, ideally, a bow-tie, though some do deviate and wear long neckties. Distinctive, bright markings intended to attract a mate are generally limited to ties and expensive automobiles. As mentioned above, suits, shirts, golf bags, socks, swim trunks, whiskey tumblers and cigar cutters MUST be monogrammed. 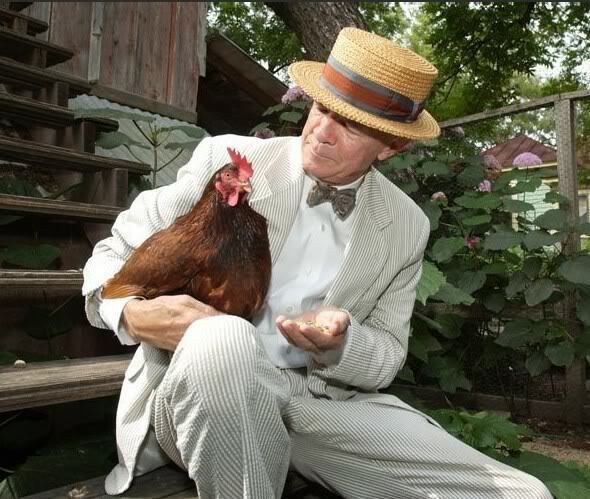 The stereotype of a Southern man dressed in a full seersucker suit and white bucks is absolutely based in fact. In the dog days of summer, this is the Southern gentleman’s uniform. As an aside, when we first moved to Atlanta, Ad Man and I went out for dinner one night with our real estate agent and her husband. As soon as I saw her husband, I exclaimed, “Ooohh…look at you in your cute seersucker pants!” only to realize that he was wearing them with absolutely no irony. Oops! When at the country house, a Southern man can be identified by the bird dog and shotgun that accompany him. After the hunt (and most evenings), you’ll find the Southern male clinging to a bourbon, neat, or a gin and tonic. 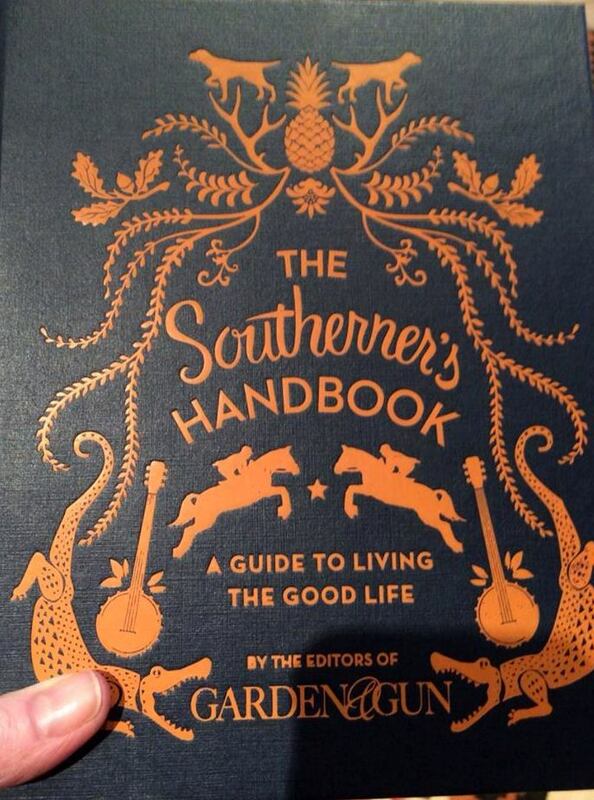 Well, I hope you now feel better equipped to spot a Southern lady or gentleman should one wander onto your land. One may no longer simply rely on listening for the call of the southern accent to identify these creatures in the wild. The southern accent, at least in cities, seems to be going the way of the blue-footed boobie…with the exception of ‘y’all,’ of course. ‘Y’all’ is here to stay. If I ever hear a Southerner say, “you guys,” I’ll know the rapture is coming and I’ll soon be the last person left standing in the Buckhead Barnes & Noble. Please check in next week when I describe the many, many ways in which I am a pathetic failure as a Southerner.